Rip currents, commonly called rip tides, affect Florida's coasts, and pose a life threatening situation to the unsuspecting beach goer. A rip current is a strong surface current flowing past the surf zone that can pull even strong swimmers into deeper water. Most deaths occur when people caught in the current try to swim toward the shore against the current; they become totally exhausted and drown. Many times would-be-rescuers are also caught and drowned. Rip Currents are normally 10 to 30 yards wide, and the best escape from them, especially for the weak or non-swimmer, is to wade or swim parallel to the beach. The rip current weakens rapidly a short distance seaward of the sandbar that creates them. Another means of escape is to float with the current beyond the breakers, then swim shoreward at an angle away from the current. 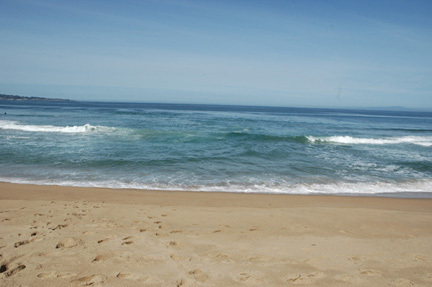 A person can recognize a rip current in the surf zone by a discoloration of the water that extends in a band offshore, or a foam or seaweed streak extending seaward from the breakers. Beach patrol personnel, who can easily see these characteristics from their elevated towers, post warnings on guarded beaches when they are observed. Rip currents can occur at any time of the year, but the majority of deaths occur from March to August when a large number of bathers and favorable wind conditions coincide. Many victims are tourists unfamiliar with surf conditions. However, local residents are also at risk. The old and the young and the non-swimmer are particularly susceptible. If possible, always swim at beaches guarded by a beach patrol and heed their advice. Do not overestimate your swimming ability and take chances. If caught in a rip current, signal for help in the direction of the beach patrol and try to swim parallel to the shore. Do not get caught in a rip current trying to save someone else. Throw them a flotation device and get help from the beach patrol.